A cozy new construction efficiency in the heart of Frenchman street area. One block from the Local Jazz and Blues clubs of Frenchman St, two blocks from the French Quarter and three blocks from the river. This one block of Touro Street is safe, quiet and home to friendly neighbors and pets. Your cubby is quietly tucked in the back courtyard surrounded by palms and tree views of the other courtyards. Parking on street is free with our visitors pass. Also, a new streetcar line can be caught three blocks down. This line connects to all other streetcars for traveling throughout the city. Small/medium size pets are welcomed! We have an enclosed side yard and a dog friendly park and bar (!) down the block. When the windows are open, you get the sounds of the Jazz nearby, trains in the distance, Mule-drawn carriages, and the river boats. The Unit has refrigerator/freezer, microwave, dishes, and Kuric coffee maker. Television and Internet are provided. Separate, private, Laundry/Closet/Bathroom is attached. The bed is a queen size sofa bed with a memory foam mattress. The bed pulls out to a platform..no springs or bars super comfy! Your separate entry will provide privacy and security during your stay. Guests may also enjoy the front porch of the main home to people watch or just enjoy the sunset. As a 5th Generation New Orleanian, I finally moved from uptown to the best Block in the city. Wow, I just love my new life in the Marigny Triangle. I spent most of my career with the NOPD but also have been very active in the community. I know most all there is to know about New Orleans. Please come share our home and enjoy our romantic city ! Location is Prime. 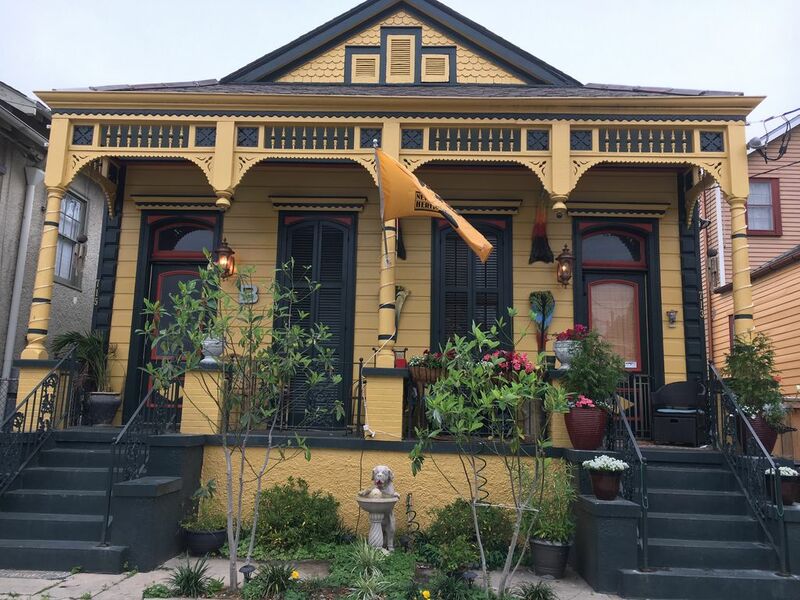 You can walk to all venues in the Marigny and the French Quarter. We live in a wonderful neighborhood and simply sitting on our front porch is a treat in and of itself. Their is plenty of foot traffic, safe and friendly. we have one female bike available. Bike rentals are one block away. Our visit was short, 4 days, and very sweet. The hosts of the Marigny cubby could not have been more accommodating and gracious, we had a delightful stay! New Orleans is a beautiful place with beautiful people and is steeped in an historical context that is compelling and calls you back for more. The Cubby is the a great value for a stay in New Orleans. The location is perfect for walking. Easy to get to the river and the French Quarter. Horns Cafe across the street is great. Frenchman Street has lots of good restaurants. Chris and Cecile are wonderful hosts. We try to come to NOLA at least once a year on vacation. Cecile and Chris were the best hosts ever and the cottage was fantastic. We had everything we needed and the location worked very well for us. We will definitely want to rent their place again if it is available. I am certain it is very popular given how great the hosts and cottage are. Clean and comfortable “cubby”. Has all the amenities needed for a wonderful stay. Owners are nearby for any questions or requests. VRBO is walking distance to everything you may want to do. Park your car and walk through the beautiful neighborhoods. The French Quarter is a nice walk away and there are restaurants, shopping and tours you can enjoy. Frenchman Street is one block away with the best in local music, along with restaurants and shopping. You may also be able to hear music at the “cubby “. A Wonderful Stay with Wonderful People! Folks, if you are looking for a place to stay while visiting New Orleans then you must check this place out. From the time we landed and meet Cecile and Chris we new we found the right spot for us. Just a few blocks away from the French Quarters and even in their neighborhood there are things to do. When we come back which we will this place is the only place on our list. Great location, Great people a Great Time.! Quaint cubby . Comfortable on edge of French Quarter. Fantastic location. Within walking distance of the entire quarter. Hosts Cecile and Chris were helpful and very welcoming. The Cubby is one block from the famous Frenchman street which hosts over 11 music venues and two Art markets hosting work from local artist. It is two blocks from the French Quarter offering a multitude of restaurants, clubs, street music, boutiques,, shopping, antiquing and galleries. The new streetcar line is just a few blocks away, tying into all the other streetcars throughout the city. A $3 all day pass is the best deal in town. Prices flexible based on demand and festival schedules, and duration.